If you have additional questions regarding EARN Maryland, please contact earn.jobs@maryland.gov. 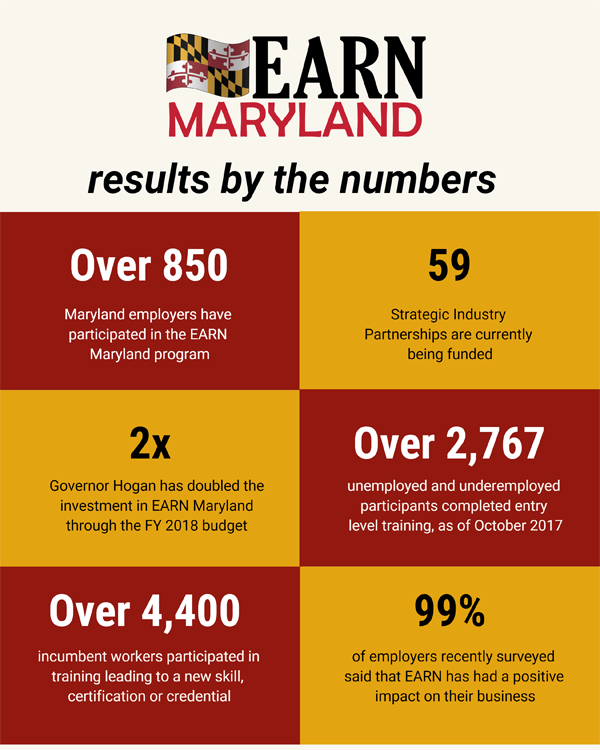 EARN Maryland is a new state-funded, competitive workforce development grant program that is industry-led, regional in focus, and a proven strategy for helping businesses cultivate the skilled workforce they need to compete. It is flexible and innovative, designed to ensure that Maryland employers have the talent they need to compete and grow in an ever-changing 21st century economy. Address the demands of businesses by focusing intensively on the workforce needs of a specific industry sector over a sustained period. Address the needs of workers by creating formal career paths to good jobs, reducing barriers to employment, and sustaining or growing middle class jobs. Encourage mobility for Maryland's most hard-to-serve jobseekers through job readiness training which may include GED® preparation, occupational skills development, literacy advancement, and transportation and child care components. How Does EARN Maryland Work? EARN Maryland invests in strategic industry partnerships from key economic sectors in every region. These partnerships will use the power of coordination across education, workforce and economic development initiatives to address the multiple needs of companies, starting with the training of skilled workers. Once formed, the partnerships will develop plans to train and educate workers - and place them in meaningful employment. Employers and other potential Partner Organizations – For information regarding how to become involved in an EARN Maryland Partnership, please contact earn.jobs@maryland.gov. Individual jobseekers – for specific questions about any of the EARN Maryland Partnerships and their training opportunities, please contact earn.jobs@maryland.gov. EARN Maryland Resource Page - Find information on the EARN Maryland Program's history, Sector Strategies in general, and other states' experiences with similar initiatives. EARN Maryland Pressroom – EARN Maryland Press Releases, and EARN In the News.